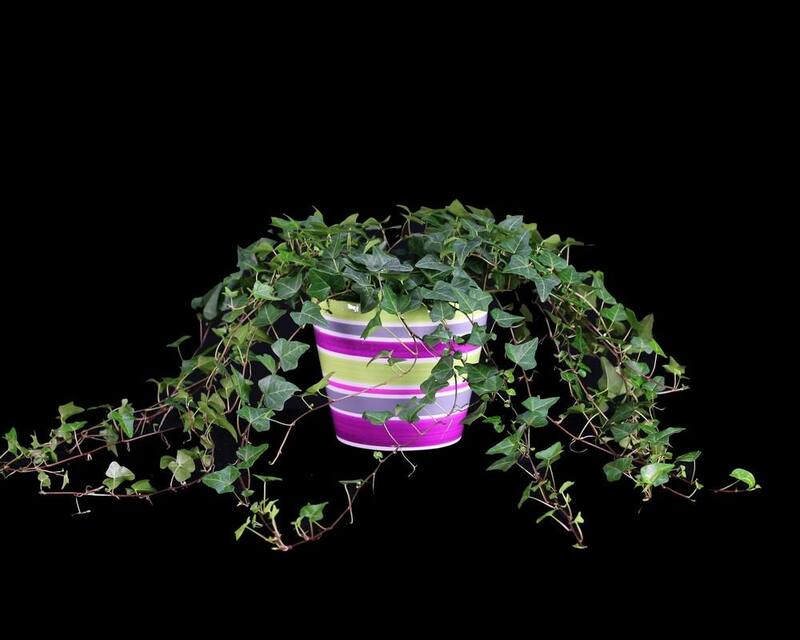 This beautiful plant is a live ivy topiary, ready to be molded into a design of your choice. English Ivy is a widely used plant, found both indoors and outdoors. When ivy grows outdoors, it is very often found climbing upon buildings, in trees, or in a vertical pattern as a ground cover. This quickly spreading feature makes it a natural choice for growing your own topiary plant. English Ivy has small, glossy five pointed leaves, mostly dark green, but often variegated leaves that lead to many uses as an ornamental plant. This ivy plant is a fast growing live topiary that can be shaped as you like into different forms and shapes. There are several options to consider when starting your own topiary. This ivy plant is a wonderful choice whether it is your first try or your tenth topiary creation. The first thing to do is to decide which base you would like for your design. Select a heavier terracotta pot if your topiary will have some height, a colorfully striped pot to complement your decor, or a trendy galvanized tin pot that would shine to your display. Make sure whichever pot you choose has good drainage; the ivy plant does not enjoy standing water. Plan out your topiary shape and select a sturdy wire frame. Common shapes are cones, obelisks, or globes, but you may also opt for something more whimsical, like a heart or star. For good balance, your frame should be about twice the height of the chosen base. It‘s best to avoid rust by investing in coated wire, and this will also extend the life of your topiary. Get ready to shape your topiary plant by securing your wire frame into the base. Make sure the frame will be well supported as the ivy grows. You won’t want it to fall over while growing! Once the wire footings are secure, gently start winding each tendril of ivy around the wire frame. Be careful not to break the vine as you go. Tie the strands in place with a soft string, raffia, or a loose twist tie. Continue as needed until all strands are used, and ready to continue growing and filling in the frame. The wonderful thing about your new topiary is that you can change and adjust it as often as you like. Ivy is drought tolerant, and only requires watering once the top inch of soil has dried. It likes a resting spot in indirect sunlight, and a dose of liquid fertilizer once a month. Pruning the ivy plant should not be an intimidating task. Ivy will grow quickly and may become bushy, overshadowing the topiary frame if regular pruning is avoided. Planning and shaping your own ivy topiary can be a calming, creative, and rewarding enterprise. Get creative and see what you can do!